This is a draft of a new map that identifies places of worship previously left out of the Community Plan. Trevor Vanderveen sent city planners five more sites that are not yet reflected on this map. Pastor Trevor Vanderveen of First Christian Reformed Church of Vancouver has taken a close look at the Grandview-Woodland Community Plan. He has spoken with city officials about some of its weaknesses related to congregations in the area, and is encouraging other concerned Christian leaders to join him at a Vancouver City Council meeting next Wednesday (July 27). The city has been working on a new Community Plan for Grandview-Woodland for the last five years. When the previous draft of the plan was overwhelmingly rejected three years ago, the city went back to the drawing board and struck a Citizen’s Assembly. 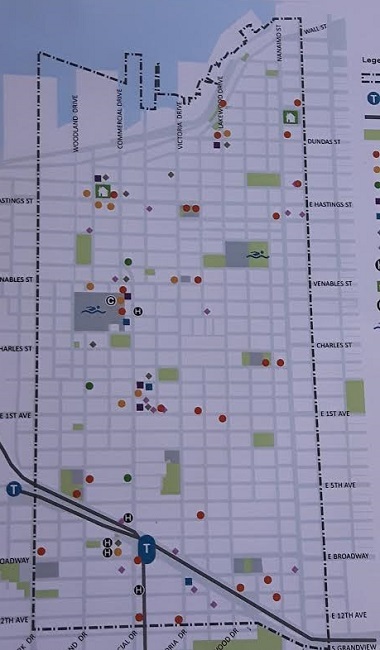 Dozens of neighbours gave up a number of their Saturdays in order to creatively engage a visionary plan that would ring true to the ethos of Grandview-Woodland, but would also address the pressure points impacting the city today – including the unsustainable increase in housing prices and shortage of adequate rental units. A member of our church was involved in the Citizen’s Assembly. Over these five years, we’ve seen the houses across the street from our church [at 10th and Victoria] sold for development speculation without knowing how many stories would be allowed; for some developer it was compelling enough to risk purchasing each of the six homes for $1.7 – $1.9 million. When the draft of the new Community Plan was released, I read a plan that was bold in imagining East 10th Avenue at Safeway as a plaza, with increased height restrictions and creativity around mixed-use zoning. I also noticed how church properties were identified as future locations of residential developments, without mention of how these properties are currently being used. These churches not only offer cultural diversity to the neighbourhood by encouraging integrated spiritual lives, but many of them also offer the neighbourhood much-needed services that the city is actually depending on. Churches lead kids day camps, host community meals, run church gardens, help refugees, assist underemployed neighbours, take offerings for other groups that do similar work and make space available for recovery groups – the list could go on. Christians are together making a positive impact on the well-being of our city. On the advice of some in our congregation and network, we identified a few issues to raise with the city. While many neighbours are worried about building heights and potential skyrocketing rental rates as newer buildings replace older ones, we identified a concern that will negatively impact churches in the future. 1. The Community Plan does not acknowledge historic or current social contributions by congregations in Grandview-Woodland. Throughout the entire 242-page document there is not one mention of Protestant, Catholic or Orthodox churches, nor of Muslim mosques or Buddhist temples. In a recent meeting with city staff, they acknowledged this error; more than 20 places of worship will be identified in the final release that will go to city council next week. 2. 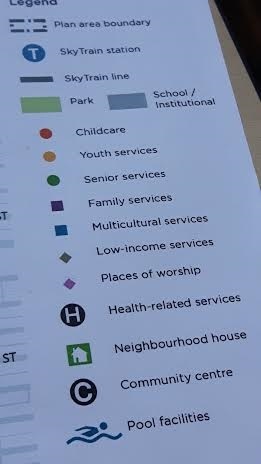 The Community Plan does not recognize the economic contributions these congregations have made in our neighbourhood. The recent Halo Project in Toronto revealed that the cumulative estimated economic impact of 10 congregations was approximately $45 million. I wonder if the annual economic benefit of churches in Grandview-Woodland is not also in the multi-million dollar range. 3. The Community Plan does not confirm that church sites will remain as church sites. While churches would not be forced to leave, when they need to rebuild due to seismic requirements, or for other reasons, they will have to contend with the fact that the Community Plan sets out a preference for residential on these social-use sites. This means that if congregations ever need to rebuild, they would need to have their plans approved within zoning that has a preference for condos and rental units. 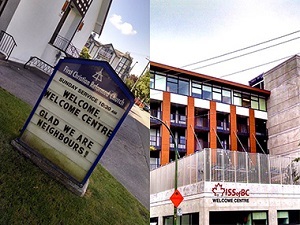 First CRC is working closely with their new neighbour, the Welcome Centrre of the Immigrant Services Society of British Columbia.. The issue is this: permission to build a church is not the same as encouragement to build a church for the good of the city. When a congregation, or any non-profit group, looks for ways to build a new building, it will likely look to a multi-purpose site that would include some residential units to help pay for a new sanctuary and meeting hall. This is a creative way for non-profits to leverage their assets while still being integrally committed to the neighbourhood where God has placed them. If a church is looking at dollars and cents, under this zoning, it will be easier to sell one more condo unit and shrink the size of a fellowship hall or a gym for the youth. One city planner who heard me state my case to help preserve these social spaces for the well-being of the neighbourhood said, “So this zoning is actually penalizing churches who want to help the neighbourhood?” “Exactly,” I responded. I have met with the city planners working on this plan and also with Councillor Andrea Reimer. Both meetings were very encouraging. They want faith-based non-profits to continue to seek the well-being of the city. They listened closely and brainstormed how to ensure churches aren’t squeezed out by development. I suggested they consider three ways: relaxing parking regulations; permitting an increase in social-space building density on these sites; and any measure that gives churches maximum flexibility in the future. Trevor Vanderveen is pastor of First Christian Reformed Church. Next Tuesday morning (July 26), 9:30 at City Hall, the Grandview-Woodland Community Plan will be officially presented to Vancouver City Council. On Wednesday, pre-registered speakers will address City Council before they vote on it. We will see how much the above concerns are incorporated into the final plan. If you would like to join the speakers list at 9:30 on Wednesday morning, you can join me by signing up here. Perhaps we can be salt and light in the council chambers by seeking the peace of the city – naming our appreciation for the city in which we live, and stating clearly how even adjustments in zoning can encourage churches to continue to invest in the social fabric of the city. 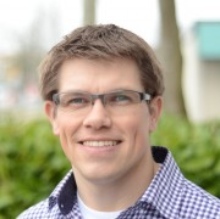 Trevor Vanderveen can be reached at pastortrev@van1crc.org. Editor’s note: In October 2013 I pointed out that the West End Community plan ignored the church as well. ← Around Town: J.I. Packer at 90, Muslim neighbours, Numb, Jubilation . . . It is great to see Pastor Vanderveen engaging on this very crucial concern. We all need to get more proactive about these long term plans for our neighbourhoods and communities.